The past four months I have been the Social Media Intern at the SEE Science Center. My main duties were to schedule daily posts on our various forms of social media. 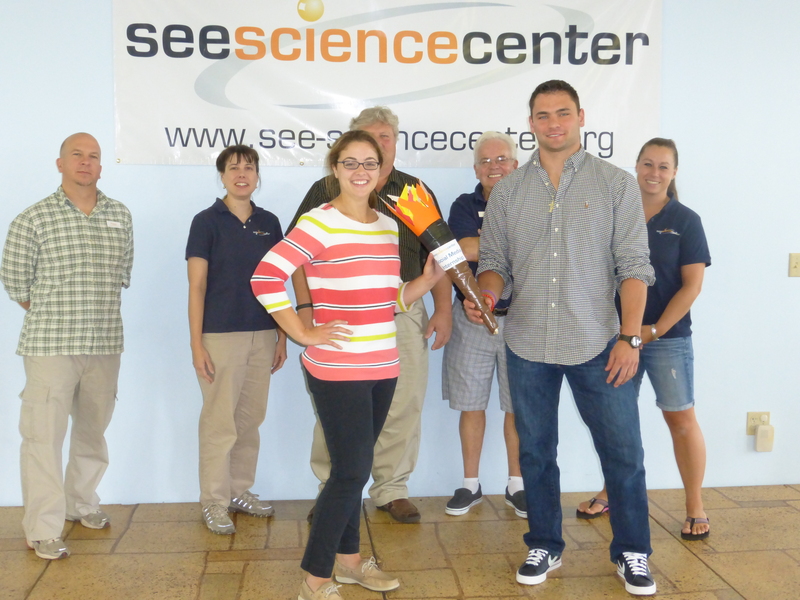 With my time coming to a close at SEE in the upcoming week I look back on my experience with the SEE Science Center. The first few weeks at SEE were the closing weeks of SEE hosting the Citizens Bank Presents Dinosaur! exhibit; my first weekend at SEE I helped advertise the exhibit at the Citizens Bank Bedford branch. Among the small duties of taking pictures of kids, handing out gift cards, and giving each kid a small dinosaur toy. I had to help haul around a 25 foot tall inflatable T-Rex in 90 degree weather in the blazing sun. That weekend set the bar high physical difficulty for assignments for the rest of the summer. Luckily the rest of the summer was spent in air conditioning behind a computer. The weeks to follow were filled with tweets and the scheduling of Facebook posts with an occasional uploading of a photo or two on flickr. Last but not least I was able to be a part of the start to this blog. The idea behind the blog was to give the public a more humanized and behind the scene look at SEE and the wonderful staff that makes this place tick. Working with a knowledgeable, friendly, and hardworking staff is all any intern can ask for. At a lot of similar internships the intern can feel inferior or a burden to the people they work with. At SEE I was greeted with smiles every day and was able to voice my opinions knowing they would be heard and considered. I can’t thank the SEE staff enough for the experience they gave me. The social media intern torch has now been passed to Leah starting in September. By seesciencecenter in Uncategorized on August 27, 2013 .